Once again, President Obama took time today to press for a tax hike, his “Buffett Tax,” instead of addressing unemployment, high gas prices, or even this country’s debt crisis. Of course, the Buffett Tax would do basically nothing to help solve any of these serious problems. Americans for Limited Government commented today, "Any fair reporting of Obama's Buffett rule would reveal it to be a cynical election-year maneuver that bears no resemblance to a sound policy designed to either improve the economy or raise significant revenue to pay down the debt. Obama's tax-the-rich proposal, which will only collect $4.7 billion on average every year over the next decade according to the congressional Joint Committee on Taxation, will cover less than 1 percent of the average $588.9 billion annual net interest owed on the national debt. "It will not create a single job. . . . "At a time when more than 27 million people cannot find full-time work — 4.6 million of whom have dropped out of the labor force since Obama took office because they've simply given up looking for work — raising taxes on capital creation is exactly the wrong prescription. The fact is we're talking about billions of dollars that could be reinvested in the economy by the private sector, creating tens of thousands of jobs. Instead, Obama wants to give it to the government so it can squander and waste it on more boondoggles. Is that fair to the American people struggling to get ahead in the Obama economy?" Bloomberg tells us it's about the White House targeting 400 people, since most high-income earners already pay a higher tax rate than middle and low-income earners without the Buffett Rule. It's class warfare. The American Enterprise Institute's Kevin Hassett told Bloomberg that the rule is “basically just a back-door way to hike taxes on capital.” When you raise taxes on capital, you will get less investment and job creation. Morning Bell also addressed this issue in their excellent Buffett Rule 101. They noted, "So how can President Obama get away with saying that Warren Buffett pays lower tax rates than his secretary? Many wealthy Americans who have done well like Buffett receive dividends and capital gains — a form of investment income that is subject to multiple levels of tax. First, the investment income results from investment. This capital didn’t appear out of thin air. It was earned and taxed previously, often many times over at rates up to 35 percent. Then, once invested, it generates income that is taxed at the corporate level at a 35 percent rate, and then it’s taxed again at the individual level at a 15 percent rate on dividends and capital gains. The combined rate on corporate earnings alone is over 45 percent, and this is all after the first layer of tax. . . . Conveniently for him, President Obama only talks about the last level of tax, the 15 percent portion, leaving out the rest. . . . And all of this leaves out the final tax that many wealthy Americans [and the not so wealthy] pay — the death tax, which is set to return to its 55 percent level in 2013." 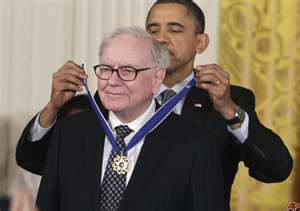 Tags: President Obama, Buffett Tax, media reports, To share or post to your site, click on "Post Link". Please mention / link to the ARRA News Service. Thanks!